This is the first time I've ever seen fresh young green almonds sold anywhere. Gotta love Parisian farmer's markets for their seasonal produce. As I was wrapping up a sale of spring cherries I happened to catch a mound of fuzzy green almonds out of the corner of my eye. I looked up to read the sign in French and sure enough it read amande frais. I shelled over 7 euros for a kilo quickly before the mirage could disappear. Why the excitement? Because it is very difficult to transport green almonds and they only have about a two week period before they turn from a premature jelly to a hard nut. 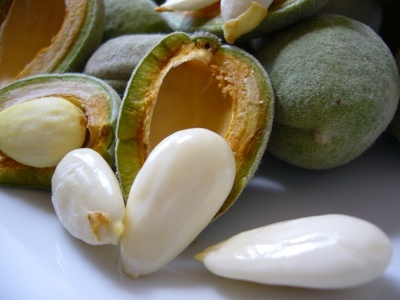 If you get them at the right stage you can pry open the fuzzy green shell and pick out the creamiest white almond seed. They are sweet and milky. Very mild, but oh so delicate and delicious. So of course the next question once you actually get them, is what to do with them? I'm sure you could bake them into an almond cream tart or scatter them over a salad, but their flavor is just so delicate that I almost think it's better to let them stand alone. I blanched them for ten seconds in boiling water and refreshed under cold water to help remove the skins (like fava beans, you gotta get that skin off because it's bitter). Then I quickly pan fried them with a little olive oil and a sprinkle of sea salt. You can toast them too in the oven on a baking sheet to enhance the flavor, but it's hard to wait that long. 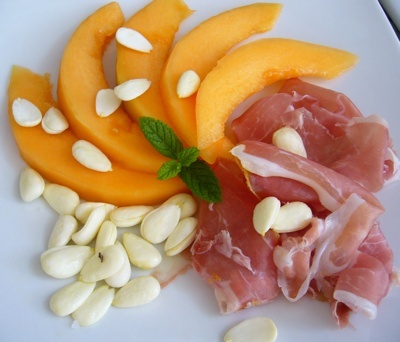 I served them along side the sweetest French melon in the world (melon rouge) and some sliced parma ham. My husband and I nibbled away with a glass of dry cold Riesling. Delicious! Oh Ms. Glaze! The Almonds! They are so delicious and so beautiful and every time I see them at the market it makes me glad one more time to be here. Mmmmm. I didn't know you get almonds like that! They sound so good, I'll be on the lookout for them. Sounds incredible... Unfortunately, I think they are pretty hard to come by in Tokyo. hahah! we grow those in our front yard (along with those quince) but the squirrels usually get to them before we can figure out what to do with them. How interesting to run across articles about green almonds today, as they are all over my yard right now and I was wondering if they were edible. So far, Ms. Glaze, your method of preparing them sounds the best of all! Simplicity usually is. Thank you for posting this. I just got these at the farmer's market yesterday and the guy told me to put them in the oven whole and roast them. I am so glad I looked into this further because I just popped one open (that's another story though - how do you open the outside without cutting off your fingers? - and it was really delicious. I'm so glad I didn't ruin them by cooking. My daughter saw children eating them at school in Jordan , so she asked me to buy them for her. Amazingly she taught me how to eat them too,you eat every thing from the green fury shell(a slightly sour) to the watery almond inside. I bet it has a very nuitricious values. I've seen them in a market in Anaheim, calif. I didn't yet buy any since they are a bit pricy, but I am so glad to learn about how to eat them. I am looking further to see if there are any special dishes to make from them.